First up during Microsoft's Gamescom press conference, Assassin's Creed: Unity. 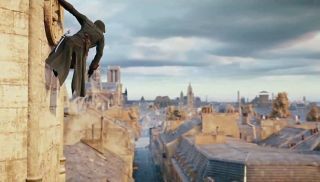 This time, we get a nice montage of game footage, as Arno runs around, above and through buildings, before the trailer cuts to some impressively populated crowds. It's not the most action-heavy of trailers, but it shows off the setting and tech nicely, and hints at some Assassin-based lore nonsense. Assassin's Creed: Unity is due out 28 October. For more, check out Sam's hands-on preview from E3.